The Autobiography Collection at the Archives of Latvian Folklore (ALF) is made up of materials people have written during various periods to document their own lives and the times in which they live. Mostly these are diaries, written life stories, memoirs, and letters, as well as various other materials providing complementary information—photographs, interviews with the authors, and their relatives’ stories about them. The Autobiography Collection was started in early 2018 with the aim of preserving and documenting the tradition of life writing in Latvia. The Autobiography Collection of the Archives of Latvian Folklore continues to grow actively. Anyone with a connection to Latvia is invited to submit materials, which can be done by contacting the collection curators. If the author/owner of the autobiographical material wants to keep the original, the material can be digitised at the Archives of Latvian Folklore (located in the National Library of Latvia), or at some other agreed-upon location. Once the materials have been digitised, they are returned to the owner. The curators of the ALF Autobiography Collection invite both private individuals and cultural heritage institutions that store such materials to assist them in growing the collection. In order to provide user-friendly information regarding autobiographical materials stored in Latvia, as well as uniform access to these materials, digital duplicates from museum, archive, and library collections are also included in the ALF Autobiography Collection. Information regarding the holder of the material is correctly indicated in the description of the collection and in the metadata. Such information may migrate together with data prepared for the homepages and databases of other cultural institutions. The collection curators have also begun collecting digital journals and autobiographical blogs for the Autobiography Collection. ALF invites bloggers who would like to submit any autobiographical writings they have published online to contact the collection curators (contact details below). 4) the material is stored in a sealed envelope until a date specified by the author/owner. Materials submitted to the Archives of Latvian Folklore Autobiography Collection are registered and published online in the digital archive garamantas.lv. Currently, all material of the Autobiography Collection is written in Latvian; it consists of 22 sub-collections, though the number of submitted material grows almost each week. The map (made by Nodegoat tool) shows the geographical distribution of metadata of the Autobiography Collection by July 2018. Researchers from the Institute of Literature, Folklore and Art of the University of Latvia (LFMI) who work with this collection are carrying out a number of publicity events to inform the public about the materials that can be found in the Autobiography Collection, in particular to show society at large importance of life writing and the need to preserve this kind of material for future generations. A Twitter and Facebook campaign was launched in March 2018—a profile was created for Emīls Pudelis (1893–1969), who faithfully wrote a diary for several decades beginning in 1912. 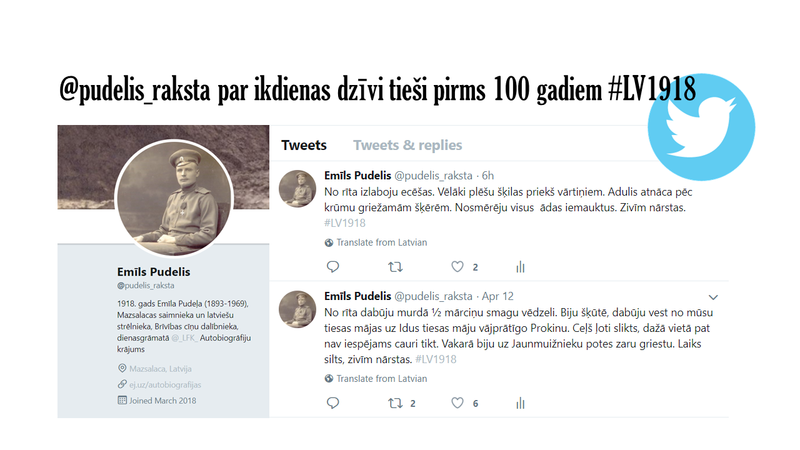 The journal entries Emīls Pudelis wrote exactly one hundred years ago are published every day on his Twitter and Facebook account.